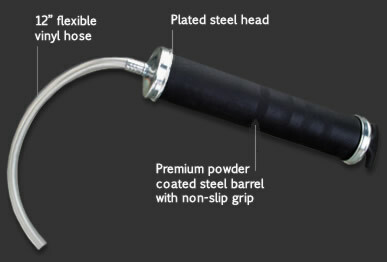 SAE Products® suction guns feature a premium powder coated steel barrel, deluxe lip seal for maximum suction, and a 12 inch flexible vinyl hose. Suction gun requires no priming. Suction guns are designed for draining and filling non-corrosive liquids and oils in gear cases, transmissions, and other applications. Suction gun requires no priming.